The diehards always show up first. Go to any protest or march and odds are you’ll see them before you see anyone else. They’re there before the cops and before the media and before the organizers themselves. All you have to do is look for a small handful of aged men and women huddled around a park bench or a street corner with a trove of pre-made signs and placards resting on the ground, some of which have probably been used at multiple rallies for various causes. In spray paint and sharpie marker, they shout out their slogans: Banks Got Bailed Out, We Got Sold Out; Tax the Rich; Freedom From Austerity. Each one brims with the type of anti-government, egalitarian fervor that has characterized grassroots American progressive movements since the agrarian populism of the late 19th century and which has become central to the success of the Occupy movement. That Occupy and the perpetual hot mess that is the American Left have recently seen an uptick in prominence shouldn’t come as a surprise given the dire state of the American worker and the fact that we find ourselves living through a sort of Second Gilded Age. What has been both surprising and eminently foreseeable is the fact that rural and suburban whites, groups which had for the first 175 years of the republic’s existence usually reacted to plutocratic injustice and economic hardship by shifting left towards groups like The Farmer-Labor Party and embracing social welfare programs like those in The New Deal, have reacted to recent financial and political crises by sprinting to the right. 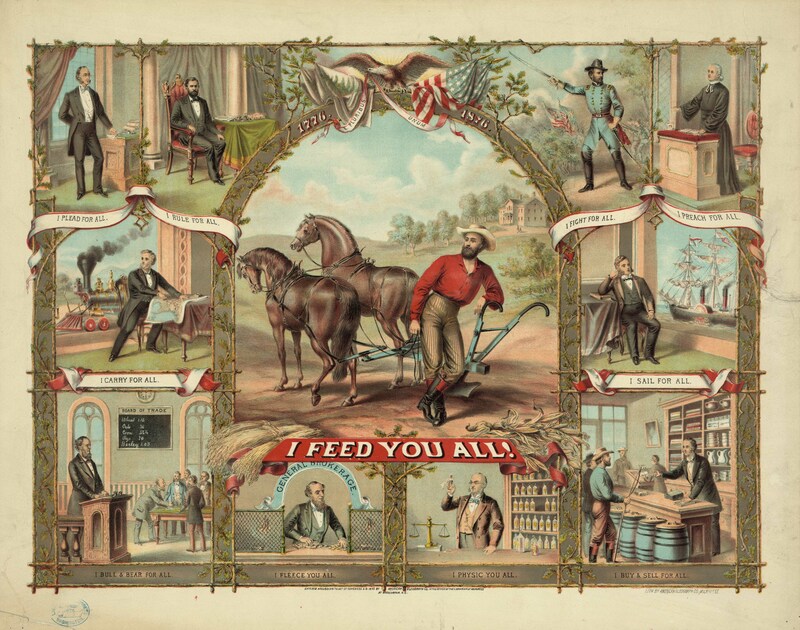 “I feed you all!” was a lithograph created by The Grange Movement, a agricultural advocacy group and fraternity that was a precursor to the Prairie Populist movement of the 1890s. The unique thing about populism is that it’s an amorphous ideology that doesn’t belong to any one side of the political spectrum. The American Populist movement started out at the end of the 19th Century with a leftist bent, advocating for the rights of small farmers in opposition to the Democratic and Republican Parties, who were controlled by corporate interest and generally acted as their surrogates. These pioneering populists, who came principally from the south and the plains states, promoted a platform that called for, among other things, a graduated income tax, government control of all railways and increases in public works projects in the event of a depression. Keep in mind, the people advocating these reforms were comprised primarily of poor white farmers. Can you imagine rural whites coming out in large numbers today to demand a progressive tax structure and further government intervention in their lives? The idea of the city liberal and the country conservative has become so deeply rooted into our collective American consciousness that the very idea of a political universe that deviates from it seems patently absurd. The only problem is, it’s not. As recently as 80 years ago, Franklin Delano Roosevelt pulled in 89.9% of the popular vote in the Deep South.I’ll wait while that little statistical nugget sinks in, and then I’ll repeat it again in case you’ve managed to convince yourself that you just hallucinated reading it. FDR, arguably our nation’s most progressive President and the architect of the largest social welfare and economic recovery program our country has ever seen, received nine out of every ten votes in Alabama, Georgia, Louisiana, Mississippi and South Carolina during the 1936 Presidential Election. (1) And all of this is more than a quarter century before the passage of the Voting Rights Act, meaning that the overwhelming majority of these votes were cast by rural whites, the same people we consider to be intractably conservative today. So, what happened? The answer, as it does with most of American history, lies in race and class. In many ways, the Prairie Populism of the 1890s serves as an ideological forerunner of the Occupy movement today. It was a grassroots movement that sprung up in response to tremendous income inequality and an accumulation of wealth in the hands of a small class of robber barons and aristocrats who exploited their workers for financial gain. Ideologically, the early populist movement was a throwback to the old Jeffersonian notion of the independent yeoman farmer being the bedrock of democracy. Of course, these yeoman farmers are now all but extinct in the US due to the almighty hand of agribusiness. The corporate hoards at Monsanto and Arthur Daniels Midland have gobbled up nearly every acre of land in sight for their profit, encouraged by an expanding, globalized economy and corporation-friendly regulatory agencies to stoke the fire of their own excess at the expense of those who need every bit of what they have. They have been able to do this, in large part, because the ever-dwindling yeomanry subscribed to Jeffersonian views on race as well. A good example of this is Thomas E. Watson, a US Congressman and native son of Georgia who was instrumental in the founding of the state’s Populist Party. Watson was born five years before the first shots of The Civil War were fired, two miles outside of the town of Thomson, GA. Well-to-do land and slave owners at the time of his birth, the Watson family would quickly see their financial security evaporate as they lost the bulk of their wealth during the war and Reconstruction. Watson’s family lived just north of Sherman’s March to the Sea and there’s little doubt that Watson saw the Union soldiers marching through McDuffie County, looting homes, setting fires and leaving Sherman’s Neckties(2) as parting gifts. After earning his law degree and serving a brief stint as a state congressman, Watson was elected to the the US House of Representatives after aligning himself with the Farmer’s Alliance, a newly formed populist group of Southern farmers who had been mobilized by the bereft post-Civil War economy based primarily around sharecropping. In the early 1890s,Watson tried to recruit for the Alliance by appealing to class solidarity over racial division, calling on both poor white and poor black farmers to band together and fight back against the new monied elite. Despite the extreme destitution in the South at the time, Watson’s vision of a racially unified populist movement never came to fruition and, after a making a failed bid for the Vice Presidency on a Populist ticket with William Jennings Bryan in 1896, Watson decided to exchange a platform of unity with one of bitter division. By the turn of the century, Watson had divested himself of his progressive notions regarding racial solidarity and African-American suffrage in order to become a virulent bigot. After two dismal Presidential bids in 1904 and 1908, Watson became Georgia’s foremost trumpeter of White Supremacist vitriol, calling for the reorganization of the Ku Klux Klan and attacking “Jew libertines”, Roman Catholics and African-Americans in his two publications, Watson’s Magazine and The Jeffersonian. Anyone who has had occasion to read some of nauseatingly bigoted rhetoric of the early Jim Crow South knows the sorts of epithets and racist falsehoods that were promulgated by white Southerners (and Northerners) back then, and Mr. Watson’s distinct brand of Nativist bile need not be repeated here. However, it is worth noting that in 1915, Watson played an instrumental role in the death of Leo Frank, a Jewish-American factory manager who had been charged with the death of a white woman. In 1913, White America asserted their inherent right to protect their life, liberty and property. In 2013, White America exercises the right to Stand Their Ground through the exercise of legally authorized, deadly force if, “he or she reasonably believes that such force is necessary to prevent imminent death or great bodily harm to himself or herself or another or to prevent the imminent commission of a forcible felony.” If a black woman so much as thought about asserting her right to life, liberty and property in 1913, she would be thrown in jail and possibly lynched. If a black woman tries to Stand Her Ground in 2013 by firing a gun into the air to get her physically abusive husband out of her house, she’s given a 20 year sentence in prison. When many populists talk of the rights of the people, they often don’t mean all people. Rather, the history of American Populism is rife with instances of racial injustice masquerading as a crusade for personal liberty. It’s not coincidence that the 20th century’s two most influential American populists figures were Alabama Governor and noted segregationist George Wallace and Roman Catholic media pioneer and rabid anti-semite Father Charles Coughlin. Just as Watson did, both men used populist rhetoric in order to exploit the racial and religious prejudices of white, Christian America during turbulent times and gain a substantial following. It is only through the froth and venom of these racially rooted double standards that working class Whites have not turned their bloodlust towards the men who legitimately oppress them. The inflammatory rhetoric that we hear today from the likes of Ted Cruz, Rush Limbaugh and their ilk is not by any stretch of the imagination novel. Like almost all of humanity’s myriad endeavors, they are but variations on themes that have been played out for millennia. There are few meaningful differences between a Father Coughlin and a Glenn Beck that can’t be chalked up to the peculiar circumstances of the times in which they live. Both are men who took advantage of a burgeoning medium of mass communication and dire economic straits to cultivate a culture of hysterical fear and loathing amongst their followers. The main difference is that Father Coughlin’s movement was snuffed out by progressive, sweeping New Deal Reforms that forever American life for the better, feeding and housing and providing steady work for tens of millions of Americans. However, during the economic collapse in 2008 and The Great Recession which followed, there has been no progressive force to counteract that reactionary onslaught of the emboldened American Right. Barack Obama, whatever you might think of him, is most certainly not a progressive. He is a centrist New Democrat and, even if he were immensely popular President–which he isn’t–he is incapable of counterbalancing the vitriol and conservative fervor of the far right. There was no heir to FDR’s ideological throne in 2008 and there were no bold new reforms like Works Progress Administration or the Tennessee Valley Authority. There’s not much of the left left in the Democratic Party anymore and, until it makes a resurgence, the populist mantle will remain squarely in the hands of the right. (1) Even more amazing is the fact that in Mississippi and South Carolina, arguably the two most staunchly conservative states in 21st century America , 271,724 out of 277,579 votes were cast for FDR in the 1936 Presidential Election. That’s nearly 98% of the vote total for those two states. To give an idea of how unreal that is, the best Ronald Reagan managed to do in an individual state when he wiped the floor with Mondale in ’84 was 74.5% in Utah. (2) “Sherman’s Neckties” was the name given to railway rails that had been heated up and twisted into loops so that the Confederates could not reuse them. They were so named because the rails bore a resemblance to a necktie when bent. A quibble: “there’s little doubt that Watson saw the Union soldiers marching through McDuffie County, looting homes, setting fires” — actually, there is a WHOLE LOT of doubt about these stories among historians. Rich plantations were treated very differently from hardscrabble hill folk, yet there is literally nowhere in Georgia that doesn’t claim to have been burned by Sherman — even in places where his army never actually marched. I have heard people in South Georgia swear up and down that Sherman’s army razed their towns too, yet the record shows not one union column was ever even seen that far south of Atlanta. So if you add up everyone and everywhere in the state that claims to have been set afire by Sherman’s troops, Georgia should have been burned to the ground five times over by magic, invisible union soldiers. Georgians who haven’t lived in the state for more than a generation are convinced they witnessed the burning of Atlanta themselves, but it’s just a cultural memory that’s about nine-tenths nonsense. These falsehoods were erected in the memories of people who were desperately trying to forget how they had started the War of Southern Aggression to protect their “peculiar institution.” Psychologically, they needed to replace the horrific, ugly truth with a convenient, happy lie.